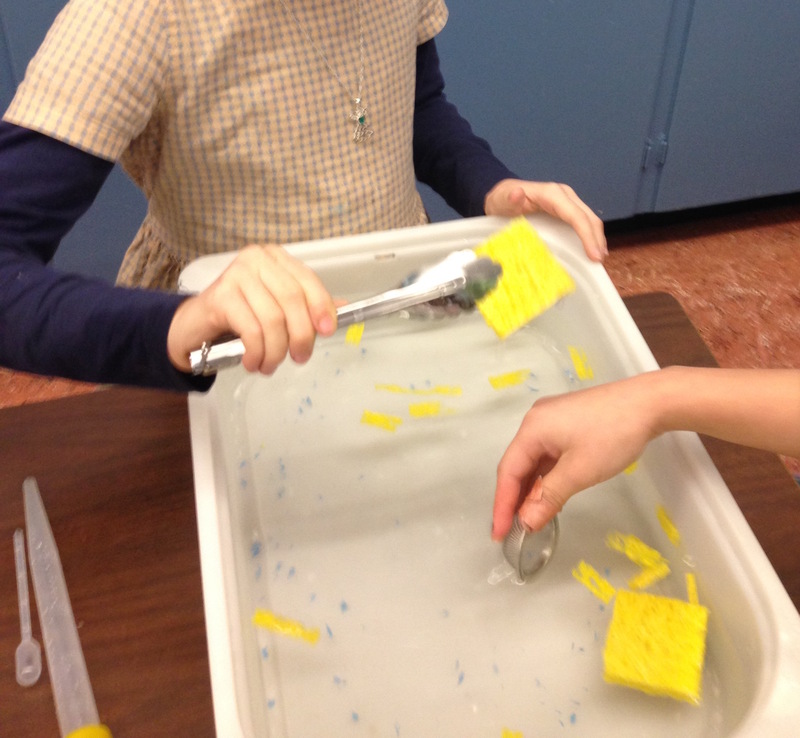 Use tools such as pipettes and tongs to model how different fish feed. 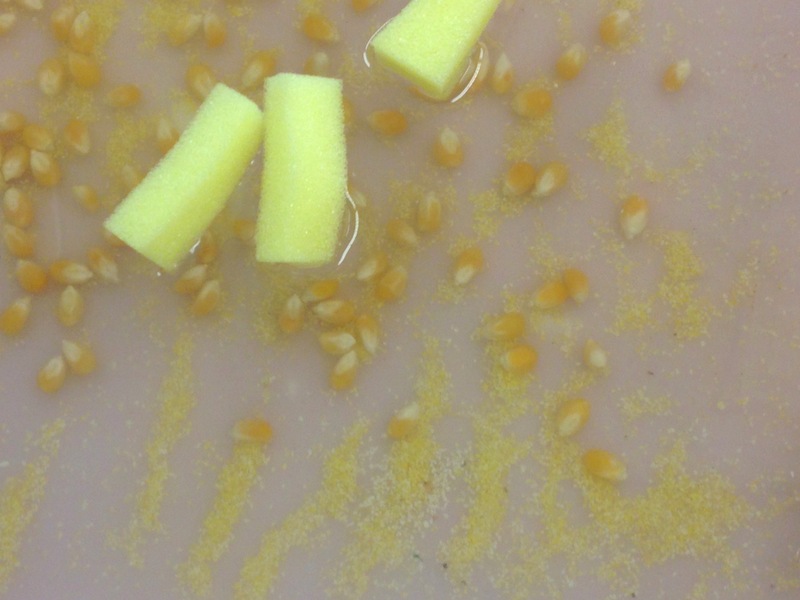 foam cut into pieces, about 1cm X 1cm X 2cm - "large food pieces"
popcorn kernels - "medium food pieces"
cornmeal - "small food pieces"
The sponge, corn kernels and corn meal model different kinds of food of different sizes (different sized foam pieces are also pictured). The utensils represent different kinds of ways that fish catch food. What is the easiest “food” to catch with each kind of mouth? 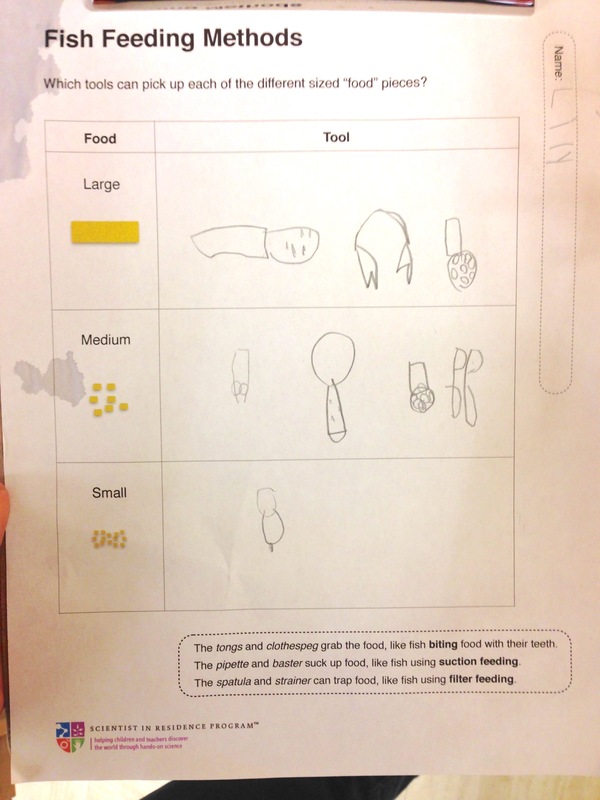 Students can use the worksheet to record what they find. Some fish feed by biting pieces off their prey e.g. sharks, piranha, adult salmon. 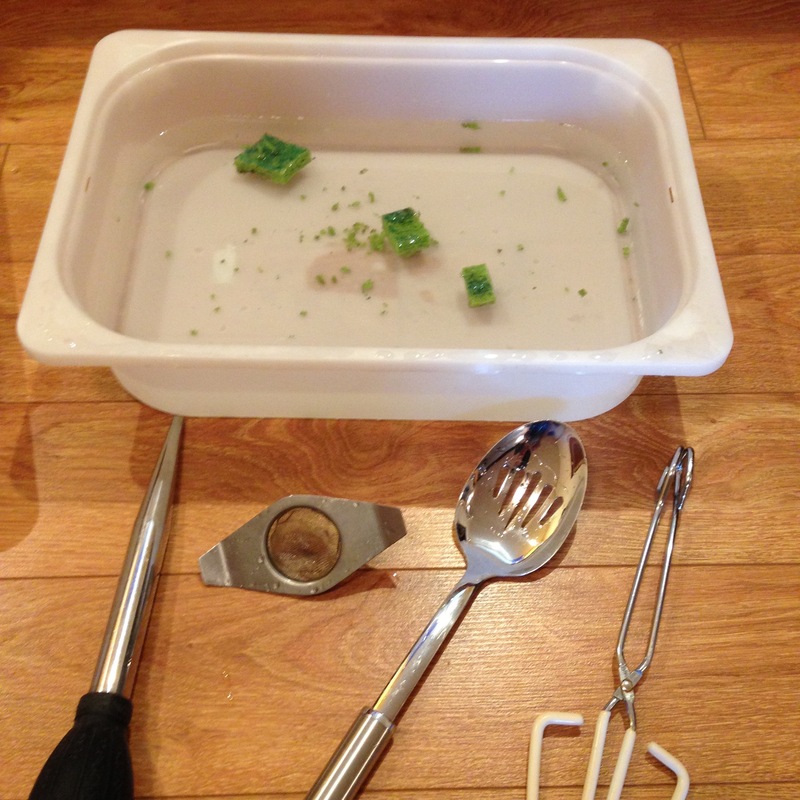 The tongs and clothes pegs grabbing onto large pieces of foam model this kind of feeding behaviour. Fish use suction feeding. Food that is smaller than the mouth is sucked into it by a pressure difference when the mouth is opened. Most bony fish feed in this way. The baster or pipette sucking up medium and small pieces of food models this kind of feeding behaviour. For a video of suction feeding try Wikipedia webpage “Aquatic feeding mechanisms”: https://en.wikipedia.org/wiki/Aquatic_feeding_mechanisms. Some animals, instead of sucking water (and prey) into their mouths, move forward to engulf prey their mouths - called ram feeding. The prey is trapped in the gill raker (a mesh). Tuna and whale shark eat this way. Ram feeding modelled by the slotted spoon or spatula. When tiny animals are caught by a mesh or filter, it is called filter feeding. Water and food can be brought into the mouth by either suction or ram feeding, then the water is expelled. Baleen whales technically filter feed, as do fish with specialized gill rakers that catch tiny particles (e.g. some sharks and herring). Barnacles, mussels, oysters and other shelled animals catch tiny animals from seawater in their filters. Filter feeding of tiny particles is modelled by the tea strainer and sieve. Watch real barnacles feeding as an example of filter feeding. Adult salmon use their teeth for eating (though sockeye don't have big teeth and continue to eat krill). 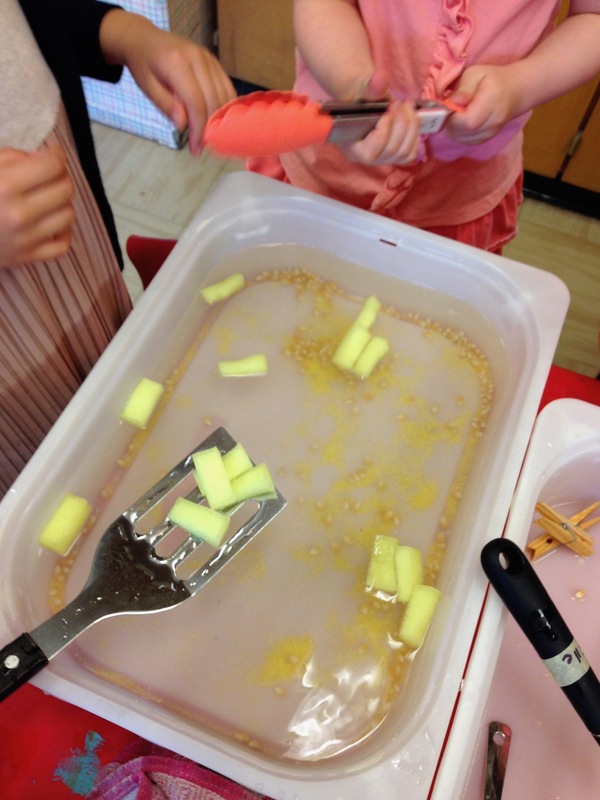 Aboriginal Focus School combined this activity with the Animals Moving in Water lesson, for a long lesson on how animals move and feed in water.